Marines with Transportation Support Company, Combat Logistics Battalion 2, conducted simulated High Mobility Multipurpose Wheeled Vehicle convoy training at Marine Corps Base Camp Lejeune Oct. 7. The evolution was part of the three-day Convoy Leader’s Course preparing motor transport operators from the unit to complete different tasks required for effectively executing mounted patrols. According to instructors, the students must be prepared for possible hostile threats while conducting convoys. "Their primary job is getting from point A to point B, but if something happens in between, they must know what to do," said Sgt. Jeffrey Gause Jr., chief instructor with Battle Skills Training School. "That’s where our job as instructors comes in by teaching these Marines how to survive when it comes to combat situations." A typical convoy requires four to five Marines to function properly. During operations, the driver and vehicle commander assume the largest responsibility in terms of transporting quickly and safely. "The driver’s job is navigation and is solely responsible for the truck, including maintenance and load-out planning, while the vehicle commander takes accountability of everyone in the truck and communicates between the other vehicles within the convoy," said Gause. The vehicle commander also operates the Blue Force Tracker, which is a global positioning system providing precise locations of both friendly and hostile forces to a combat operations center. 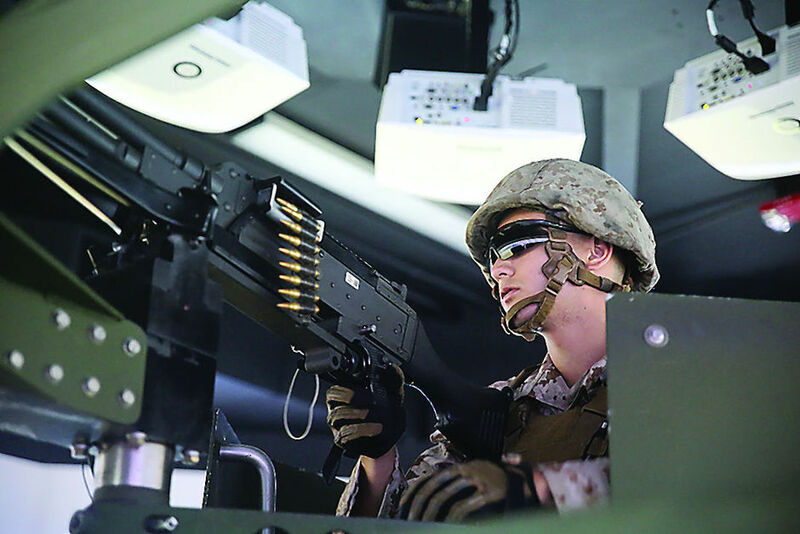 A third Marine is designated as a gunner, covering a Humvee’s field of fire with a crew-served weapon, such as an M240G or M2 .50-caliber machine gun. Finally, one or two Marines act as dismounts, assisting the convoy by checking for possible threats near their respective Humvee when required. "A dismount’s job is to leave the truck when instructed and inspect five meters around the Humvee for any threats, specifically (improvised explosive devices). Once the area is clear, they post security until the gunner calls them back into the truck," said Lance Cpl. Ryan Leech, a motor transport operator with CLB-2 and dismount during the training. By cycling through the different positions within the convoy and emphasizing the idea of small-unit leadership, the Marines were able to better prepare themselves for an Integrated Training Exercise later this month, which will combine logistical, aviation and ground combat elements. "Through leadership by example, the Marines will do what you need them to do, which is huge when it comes to combat situations. There’s always chaos, but it’s about how you control that chaos," said Gause. "The training is beneficial because it gives us real experience to what we could be facing," said Leech. Doing it over and over until it becomes second nature is what will make us successful." Republished with the permission of the "The Globe".